Back in June, I was the guest writer on One Love for Christ - the blog of my friend, Hannah. Now, if you've been around for a while, you know that creation/evolution topics are kind of my thing. Creation Science and Christian Apologetics have been a passion of mine for many, many years. This is exactly what is happening in our churches today! Many Christians believe that God created everything. However, they also accept the ideas of evolution, saying that God could have used evolution to create. They take positions such as the Gap Theory, Theistic Evolution, and Progressive Creation to explain such beliefs. As I began to research the subject of evolution in the church and the results of such thinking, I was saddened and disturbed by what I learned. Statistics state that 61% of today’s young adults had been churched at one point during their teen years, but are now not actively attending church, praying, or reading the Bible. So, why are we losing two-thirds of our youth by the time they reach their college years? 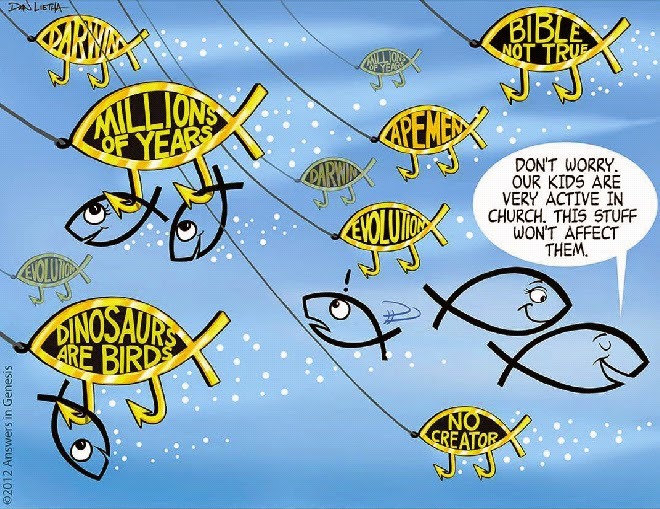 In many churches, Christian leaders and parents have told their children that it doesn’t matter whether they believe in evolution and millions of years or whether they believe in what the Bible teaches as fact, as long as they trust Jesus. But in so doing, they undermine biblical authority! You see, if we invalidate the foundational book of the Bible, then who’s to say we can’t alter the rest? If kids are told that they can reinterpret Genesis on the basis of what secularists say about the age of the earth, why should they not also reinterpret what the Bible teaches about marriage and other issues on the basis of what the same secularists believe? That is why we have the issues of gay marriage and abortion in the church – topics which, just a hundred years ago, would have been unthinkable in Christian circles. Genesis is the foundation on which the whole Bible was laid. All of Christianity rests on this book. Doctrines like sin, marriage (one man + one woman), why we wear clothes, why we need a Saviour, etc. – this is all found in Genesis! Every single biblical doctrine of theology, directly or indirectly, ultimately has its basis in the Book of Genesis. If you destroy the foundation of anything, the structure will collapse. If you want to knock down a building, you are guaranteed early success if you destroy its foundation first. Likewise, if one wants to destroy Christianity, then he should begin with the foundational history found in Genesis. When children go to church, I have noticed that they are being told stories: “Who wants to read a story about Noah’s Ark?”, “…Jonah and the big fish?”, etc. and then they go to school the next day and are taught the “real history” of the earth – the anti-biblical foundation of evolution and millions of years. This foundation, of course, cannot allow the Christian structure to stand. In our Sunday schools, our kids are being taught what the world calls “fairy tales”, and we wonder why they don’t believe in true, biblical accounts. This is the problem. Because of compromise in the church, increasing numbers of the next generation – my generation – have made man the authority – not God. So, that's what I've got for today...I hope you all are enjoying this fine October weather!